"Current Issues in Marketing in the Information Age, 2nd. Edition"
INTRODUCTION A basic education in business and marketing at the college or university level gives the student an understanding of the 4P's - things you can do something about, and the 6 environments, - things you cannot do anything about. INTRODUCTION How you react to the influences of the 6 environments is the key to your success. You can monitor the changes in an environment and plan accordingly, or you can just react as each situation develops and hope to survive. Successful companies are the ones who see trends developing and plan in advance to deal with the anticipated changes. Understanding the effect of the environments, that influence business, is a major part of a good marketing education. Many times in the semester we will discuss various topics and these discussions will invariably include some aspect of how the topic is effected by the 6 environments. When you read the list of 6 environments below, keep in mind some current business stories in the newspaper and see if you can apply each of the environments to the story. In many countries, the economic / financial environment is heavily influenced by the political environment in the context of government rules and regulations as to how businesses make money, as well as how businesses are taxed. Legal / Regulatory The Political / Legal / Regulatory environment is often a direct consequence of the political parties in power, which represents the popular opinion of the citizens of the region. If the citizens are, for example, pro-Big Business then probably taxation will be modest and there will not be a lot of stringent rules about environmental considerations.If the citizens are very concerned about safety issues, for example, then there will be a lot of rules and regulations governing things such as transportation safety, which will make it more expensive for some companies that have big shipping costs. The rules and regulations created by the politicians, have significant influence on the cost of running a business and the way it can market products and services - for example in Canada there are severe regulations about advertising for alcohol and tobacco. 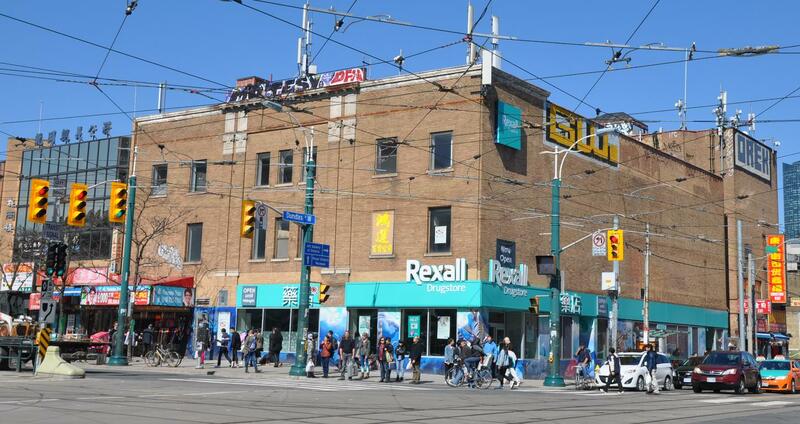 Linguistic The Sociocultural / Ethnic / Linguistic environment is more and more influential especially in multi-cultural urban areas such as Toronto, New York, London, etc. For companies selling industrial products, which are often simply marketed by dimensions (size, weight, height etc.) there is not a strong requirement for documents and packaging material to be "culturally sensitive". For companies selling consumer products, particularly food and clothing, it is increasingly important to use all the languages of your customers in your promotion campaigns and communicate effectively with your target demographic. rules and laws about equality based on considerations of gender, race, sexual orientation, maritial status etc. relationships between people of difference faith, ethinicity, language etc. how companies used people in commercials to focus on a "target market segment"
Technological When most people think of the Technological environment the first thing that comes to mind is whether or not they "have the Internet". This is only one part of the world of business. The technological environment could be something as simple as whether or not vendors use Interac to receive payment, or do you have to pay cash. The technological environment also covers road and rail and ocean transportation as well as communications. The ability of a company to be competitive also includes access to high speed communications - some parts of the world have highly developed fiber optic cables, other parts don't even have land lines for phones. In some parts of Africa, technology has been delayed for decades, but when it did arrive, they skipped directly to cell phones without even bothering to put in telephone poles and land lines. One of the key characteristics of the technological environment is that the infrastructure is very expensive. It is usually a national government who funds the projects that allow telephone and cell phone networks to be constructed. The degree to which a region has an advanced technological environment is often related to the health of the economic environment which would contain the companies that are making money, and paying taxes, to support the government funds spent on the infrastructure. In some courses we refer to only 5 of the environments; leaving out geography, because most people think the Web transcends geography. In reality, it is not so simple. Geography also effects weather and weather has an effect on the internet from a technological point of view. Weather situations can cause disruption of communication lines which means the "web is down" in parts of the world effected by a crisis. In some places effected by an earthquake, or tsunami, it can takes days or weeks for telecomm services to be restored and in that time period web based services cannot be accessed in the effected region. Physical / Geographic The geographical environment also includes topographical challenges and advantages. Challenges apply when the land is very steep, which limits the available acreage of arable land so you cannot grow enough crops (like n the sides of steep hills or old volcanoes as in the case of Japan). Advantages take place when the land is flat, and the soil is rich in nutrients, like in our prairie provinces of Manitoba, Saskatchewan and Alberta. This land Canada has in the middle of our country gives us an incredible advantage in terms of being able to grow our own food. Countries who have geographic environmental limitations have to import massive quantities of food which is expensive and, to some extent, effects the national sovereignty. The Competitive Environment is, perhaps, the most important of the 6 Environments that influence a company involved in marketing, business, International Business or e-commerce. The degree to which one attends to the "other" environments is a consequence of the intensity of the Competitive Environment. A Case Study To assist in understanding the importance of "applying" an understanding of the 6 environments, we will analyze a 2003 story in the context of what environments are influencing this particular trade situation. Title: "Don't ship Canadian beef, Japan to tell U.S."
"TOKYO—Japanese Agriculture Minister Yukio Hattori will ask the United States to ban the exportation of Canadian beef bound for Japan via the United States, citing continued concerns over mad cow disease, according to media sources in the Japanese capital. The Japanese request comes in response to the American intention to start importing veal from Canada early next year....According to the sources, the Japanese Ministry of Agriculture, Forestry and Fisheries will be requesting that the U.S. start certifying the origin of all its beef products intended for export to ensure that nothing has come from Canada. ...Both the United States and Japan closed their borders to Canadian cattle and beef products after a single animal was diagnosed with mad cow disease in Alberta last May . The U.S. and Canadian cattle industries were highly integrated up until the mad cow scare. Canada has traditionally sold more than 70 per cent of its live cattle to the United States. permission to quote from the Toronto Star given by Joanne MacDonald (TORSTAR SYNDICATE SALES) in emails in 2004. Copies of emails kept on file in the permissions binder. Environment As a result of losing export sales to U.S. processors, (because of limitations in exporting to Japan) and a high Cdn dollar, Canadian cattle producers may be challenged by beef exporters from Argentina and Australia - two other countries which are international competitors in beef exports. Japanese declines in importing beef may effect the competitiveness of other Canadian meat product exports such as pork or chicken since meat importers usually handle all three of those products. This is a good reminder that sometimes your ability to do business internationally can be effected by the success or failure of other companies in your business sector who are selling slightly different products. Environment Laws and regulations are a consequence of what the government wants to control, which is a consequence of politics - meaning what is the government doing, or not doing, to maintain the confidence of the people and get re-elected. The Political Environment in this situation is influencing the Canadian Beef exporters through the new regulations that the Japanese government has established. These Japanese regulations (which are a consequence of the Sociocultural Environment - people in Japan fear Mad Cow) will mean that U.S. beef producers cannot send beef products to Japan if some of that beef came from cattle they imported from Canada. Example - frozen hamburger patties manufactured in the U.S. for export to the McDonald's outlets in Japan. Environment As a result of losing export sales to U.S. processors, Canadian cattle producers will be economically constrained and this will have a negative effect on the economic environment in the province of Alberta and Saskatchewan. The high value of the Canadian dollar from Q2 of 2003 through to Q3 in 2004 will make it further challenging for Canadian beef exporters to sell their product at a competitive price since importers will have to pay more. - temperature ? growing season Distance - Canada is much farther way from the markets in Tokyo and Osaka than Australia. Australia's close distance to Japan gives it an advantage in quoting prices because their shipping costs will be lower and the time the product is "in transit" is less than a Canadian export. If the time "in transit" is less, then the product is more fresh. Canadian exporters are at a disadvantage when the distance to the customer is farther than another source in Australia or New Zealand. Canada is a northern country. We have winter!! American cattle producers have less weather extremes to contend with than Canadian cattle producers, therefore it is more costly for Canadian cattle producers to feed their herds. Because it is colder in Canada, you have to feed the cattle more grain because these animals burn more calories in colder weather. Overall, it costs more to bring animals to market due to the challenges of the weather and our colder climate. - DNA analysis of breeding Agriculture products (a consequence of the richness Geographic environment) are effected by developments in bio-sciences such as hormones which make animals mature faster and gain muscle mass. Technological developments also produce variations in breeding that allow for animals and plants to grow faster and more quickly with varying nutrients. For example: - Canadians have used bio-technology to develop strains of grains that will grow in colder soil and mature in a shorter growing season. Future developments in bio-sciences may mean an end to BSE - bovine spongiform encephalopathy [Mad Cow disease] and therefore we might see the removal of restrictions on beef exports since there would no longer be fear of this disease effecting humans. Despite great marketing efforts by the Canadian government and the CBEF - Canada Beef Export Federation, Japanese people still do not eat a lot of beef as part of their diet. While the younger generation in Japan eat western style fast foods - the per capita consumption of beef is not as large as in North America and Europe. Japanese protein sources are mostly from the marine products (fish, squid, whale meat, seaweed), pork and poultry they eat. This is a part of Japanese culture which is hundreds of years old and unlikely to change in a short time. Raising cattle in the grasslands of Alberta is also part our Canadian sociocultural environment. If this lifestyle is lost due to problems exporting beef, it will be a big problem to the thousands of families in Western Canada who are 2nd and 3rd generation cattle farmers. These people are not easily converted into website designers or other new millennium workers and it would be heartless to expect them to make such a sacrifice. Variances in the Competitive market - Canada / U.S.
A good example of different levels of intensity in the competitive environment can be seen in November 2003 when Ford started selling the new F150s in the U.S. and Canada. In the U.S. market there was lots of competition from G.M. and Dodge so Ford had to give big discounts to penetrate a "price competitive" market and make sales. In Canada, Ford F150 had a great market share so they did not give discounts. "Competition forces Ford to discount F-150: Incentives won't apply in Canada Decision comes despite strong sales"
Well it is obvious, if sales are strong, why discount the vehicle - it is a consequence of the basic law of supply and demand - if demand is high, price can stay high. Ferguson wrote "Two months after the launch of its revamped F-150 pickup truck for 2004, Ford is looking to lure American buyers with extra incentives in a nod to competitive pressures and despite strong sales. But Canadian buyers — who made the F-150 the top-selling vehicle for Ford in Canada last month — won't be enjoying the lower financing rates and cash bonuses. 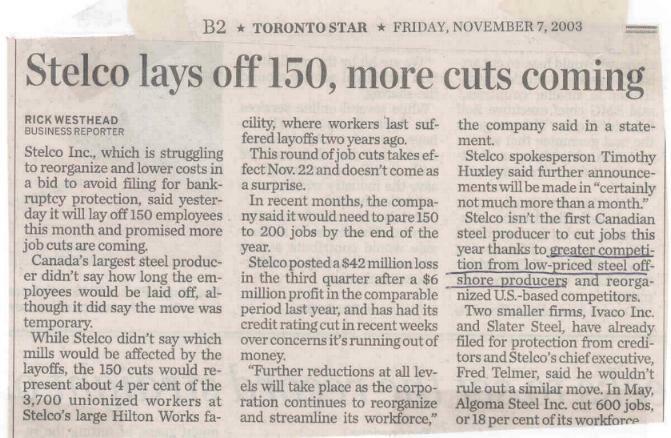 "We've set our incentives for the final quarter and I don't see any movement to revise them," Ford Canada spokesperson Chris Banks said..."
A good example of how the competitive environment internationally, can effect jobs here at home, is found in the 2003 Toronto Star story about Stelco of Hamilton. Westhead says "Stelco isn't the first Canadian steel producer to cut jobs this year thanks to greater competition from low-priced steel offshore producers..."
"Hello Sir, I came across a little article about how Netflix ( an online DVD rental company) is preparing for competition which has not yet affected the company. However, the company has decided to slash prices in order to keep the competition out. I thought this could be a good example of how e-commerce business is being affected by competition." Netflix, which first announced intentions to cut its $21.99 rental price on Oct. 14,  said customers can now rent as many DVDs as they want for $17.99 per month. WTGR says, "while Netflix may be successful at scaring away competitive with this low entry price strategy, their profits will be very low and this might be challenging unless the company has income from some other product line." 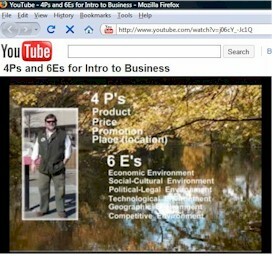 "As I was studying for friday's exam, I came across an article about e-business in the New York Times. It stated how yahoo is now using its farechase feature in a much easier way for its users." its main search engine, so that it can scan multiple sites for airlines, hotels and car rentals and show the lowest-price offers directly in results whenever someone types in, say, "lowest fares to Las Vegas." competition on the internet, with company prices going head to head with such fee finders as Yahoo's farechase. The online travel business is huge and with Yahoo developing this easy to use fare finder we can see that the business will continue to grow. Customers are always looking for the lowest price and Yahoo has given them a utility to view the lowest price with ease. 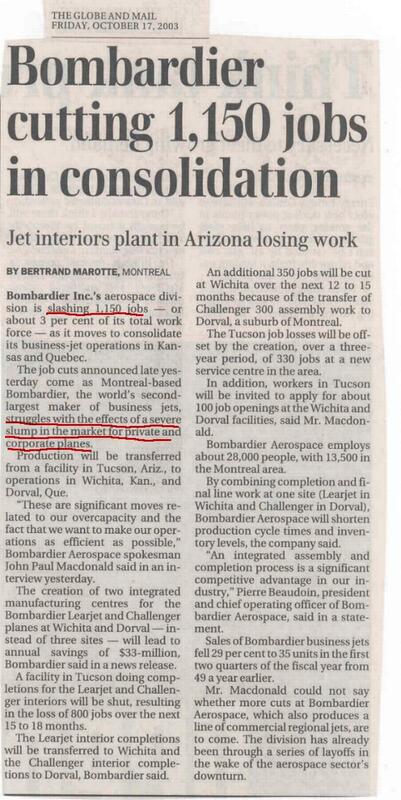 WTGR says, "Sean, I think this is an interesting example of how a technical capability has created a situation where companies are, in a sense, exposed competitively and it might be better for the consumer, but will see how it is in terms of changing corporate price planning"
A story about how the economic environment forced Bombardier to cut its workforce since businesses are buying less airplanes of the size made by the Quebec based manufacturer. 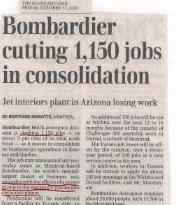 It appears most of the jobs will be cut in the United States - which is a change; most of the time it is American companies cutting jobs in Canada. 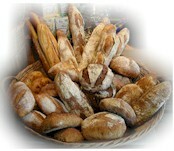 How the Atkins diet craze caused massive cutbacks in "carbs" so people in North America are eating less bread. 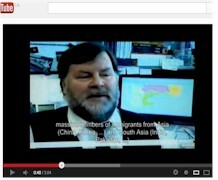 Some suggest it is not just Atkins but also the high growth of the Asian population in N.A. which prefers rice based carbs instead of bread. Result: the grocery stores are selling less plain white bread and the fast-food places are selling less sandwiches as they switch menu items. Large companies in the "bread business" like Westons (George Weston Ltd.) www.weston.ca have been effected by the social/cultural changes. In this story, Flavelle writes "North America's third-largest bakery, George Weston Ltd., is closing two plants and cutting 1,100 jobs as consumer tastes shift away from sweets and white bread and more toward healthier whole-grain products....The company, owned by Canadian billionaire Galen Weston, said all of the jobs cuts are in the U.S....The latest cuts affect Weston's Interbake division, a company it has owned since 1946 and which makes about half the Girl Guide cookies sold in the U.S., along with other baked goods. The cuts come as little surprise to analysts who follow the industry, which has been struggling to keep up with consumers' rapidly changing tastes." Richardson was interviewed by Cindy Pom of Global TV News for a segment dealing with the new telephone area codes for the Toronto region. UTM student Drew C. in MGD415 in Jan 2007 emailed to suggest that the dot.com situation (Technological Environment) has had big effect on job losses. I was arguing with my friend the other day about the amount of people that became homeless because of the dot-com bust. She found it impossible to believe that more than a few people became homeless as a result of the dot-com failures. I thought this was an interesting article that I sent to her too. It says that in Silicon Valley alone, upwards of 18,000 people became homeless as a result of the bust. WTGR adds - massive changes in the Technological Environment - which may lead to large job losses, would change the Economic Environment because fewer people would have money for buying consumer items. As economic prosperity drops, people end up living in stressed situations, which may lead to crime and violence - which in turn effects the Social-Cultural Environment. 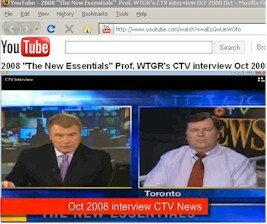 Oct 2008 Prof. Richardson gave an interview to CTV News in which he commented on a recent (2008) survey that discussed people's use of cell phones and internet access as "the new essentials"
It is a good discussion of the influences of the Technological Environment. Food and clothing are two of the consumer product categories most influenced by changes in the Social-Cultural Environment. 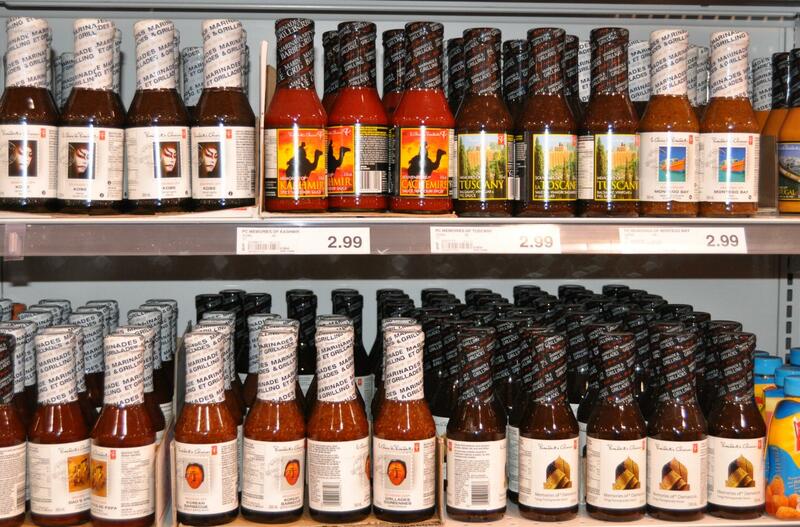 When Prof. Richardson was walking through the aisle with BBQ sauces and ketchups in his local grocery store, he noticed the incredible variety in just one category of President's Choice BBQ sauce, which appears to have attempted to "represent" every possible ethnic group that might be shopping there. 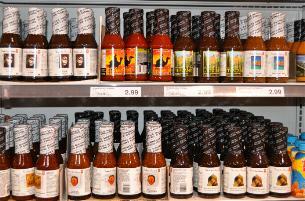 Click on the pic to the left and you can see the range of flavours. You don't need Stats Canada's Immigration figures to tell you that the growing number of Asians in Canada has an influence on marketing. 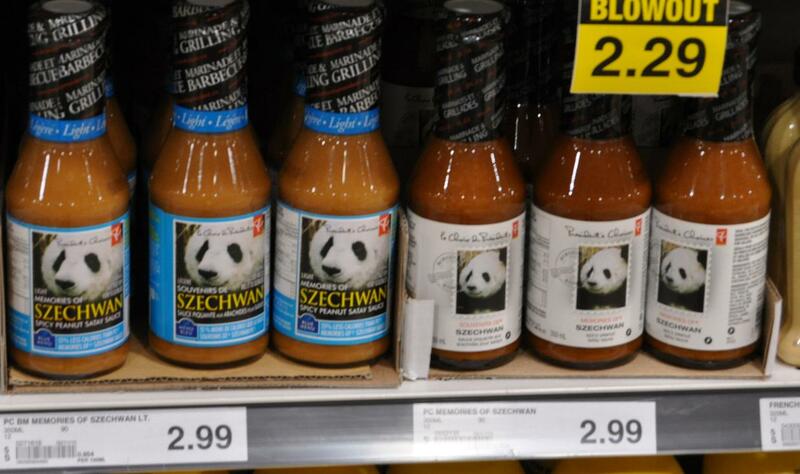 Just look at the fact that Szechwan BBQ sauce flavour is so common, and popular, it even comes in a Diet version - and this is in a grocery store 60km NE of downtown Toronto !! Listen to this clip The Canadian banks, which are VERY competitive, and have a virtual oligopoly in the Canadian market (by virtue of the political/regulatory environment) are very aggressive at following the latest trends in the social-cultural environment - a simple example is the languages offered to serve customers. 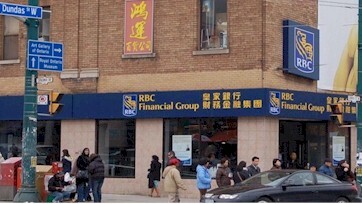 For several years now, CIBC, TD, and RBC have used Chinese characters on the signs of their branches in the Spadina - Queen St area of Toronto. 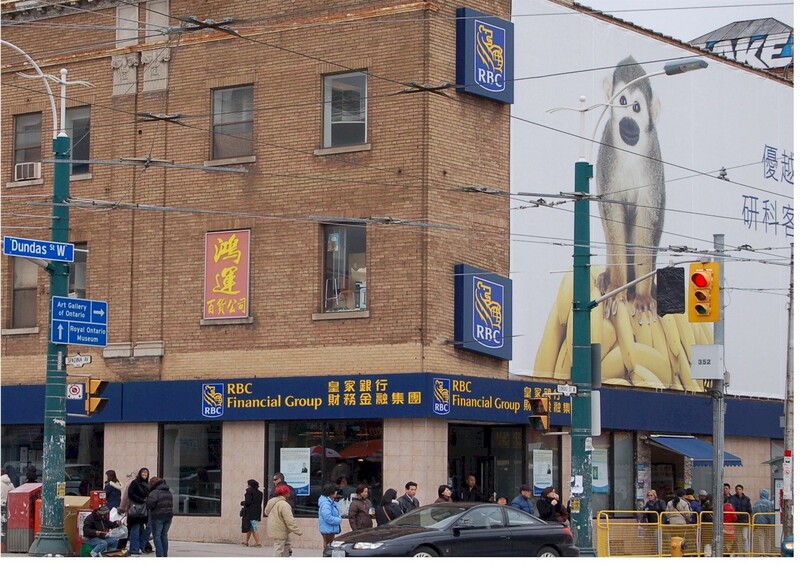 One of my former students who works at RBC in 2006 showed me that RBC now has bilingual voice mails - NOT English/French but English/Chinese; as a way of pandering to a growing demographic that the banks want as customers. Srivithya K. in BCS 555 in Sept 2004 found a great example of a website that illustrates awareness of the impact of the Social-Cultural environment - the TTC. 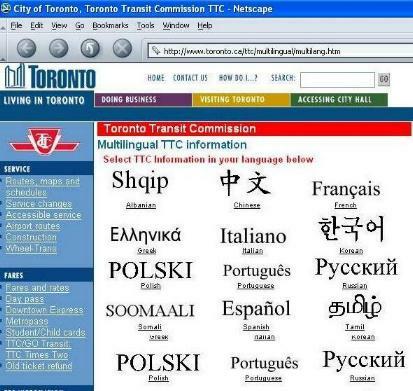 This is a good example of serving other languages because mass transit systems are used by people from all classes of society and all ages. Usually you can tell how international a city is by the way signs are posted in public places. will want to offer information about their services in the language of the target customers. 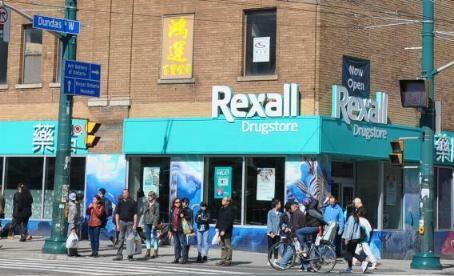 This photo was taken by Prof. Richardson when he and his wife were walking around Spadina April 2018 - the RBC Bank is no longer there - a drug store has taken the corner space.